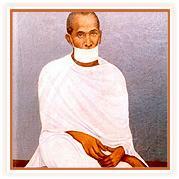 Acharya Shri Manak Lalji was the sixth Acharya of Terapanth. He was born on the fourth day of the dark lunar month of Bhadrapada of Vikram Samvat 1912 at Jaipur in a Jeweller”s house. His gotra was kharada and subcaste srimala. His father's name was Lichaman Das ji . He could not get his parents affections for long as they died while he was a young child. His father Lala Lichmanadasji brought up the child affectionately and embellished him with religious instructs. The child Manaka too was very polite towards his grand father and regards for him. In 1928 Jayacharya was at Jaipur for his chaturmas. During the chaturmas child Manaka developed vairagya. The child had learnt tattvajnana. He was initiated into asceticism on the eleventh day of the bright lunar month of Phalguna of Vikram Samvat 1928 at Ladnun. He was then sixteen and a half years. Manakgani was very polite by nature. He had very sharp's intellect and could grasp everything very quickly. He was enlightened with knowledge of agams within a few years of his consecration. He was made a leader of the group by Jayacharyaji just after three years of his consecration. He has made a lot of progress in spiritual guidance of his life under Maghraj ji after the demise of Jayacharyaji. Acharya Shri Maghrajji installed him as his deputy on the second of the dark Lunar month of Chaitra of Vikram Sanvat 1949. He remained as Yuvacharya only for four days, He was throned as Acharya on the eighth of dark Lunar month of Chaitra Vikram Samvat 1949. He was fair skinned, tall, fragile and accomplished by loud and sweet voice. He preferred long journeys and was the first acharya to have visited Haryana. With a view to expand the sect, he spend most of his time at places where his predecessors had either not gone or visited rarely.